Um, hi. Is anyone still here? It’s been awhile, I know – let me catch you up. School-wise, since fish day, we’ve covered shellfish (I ate my first raw oyster! It was slimy. And lemony and fresh tasting. I didn’t not enjoy it. I also ripped apart a live lobster, poached it and ate it with a sauce américaine. I still feel sort of bad about that) as well as roast chicken, duck à l’orange, roast pork, grilled chicken and steak, poached veal, braised lamb shank, and chicken simmered with horseradish cream sauce. I also passed the Level 1 practical exam by chopping a mean macédoine of carrot (among other things) and am now officially in Level 2. So, you know, that’s good. I’d like to tell you more about chef school, or maybe even give you a recipe, but I’m feeling distracted by tomatoes. You see, everything we’ve been making at school is delicious and fancy and french, but most of it is also very heavy and rich and wintery. And that’s all well and good, you know, when it’s the winter and you’re looking for a hot, bone-sticking meal, but it’s finally starting to feel like summer around here, and I can’t help but shift my focus to cooler, sweeter, juicier pastures. And what’s summer without tomatoes? Those swollen red and yellow skins, firm and fleshy, luscious and bright, with the scent of dirt and sunshine – they’re the consommate beacon of summertime eats. So, I could give you the recipe for a delicious veal stew in cream sauce, but wouldn’t you rather have the recipe for Jane Bursky’s tumbled tomatoes instead? They’re cool and fresh and taste like summertime on the patio. Eat them with some crispy bread and a few slices of sharp cheese, and I’d call that dinner. Yum. I usually balk at the idea of storing tomatoes in the refrigerator – nothing ruins the fresh, juicy taste of a tomato like refrigeration – but with this recipe, the time in the fridge seems to enhance the tomato flavor by giving the herb crust time to do its work. The crust draws out the tomato’s moisture, leaving the little ruby spheres with a concentrated flavor of fresh tomato. Thanks, Chef Jane! Use a mortar and pestle or a coffee grinder to mix the seasonings together and pulverize them slightly. If you don’t have a mortar and pestle or coffee grinder, just skip this step. Wash tomatoes in cold water and drain, but do not dry them. 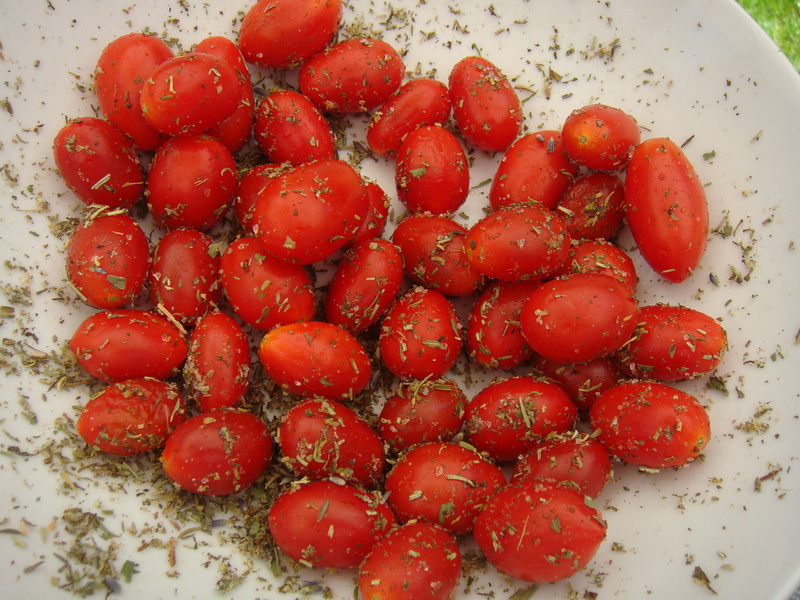 Put the tomatoes in a large bowl and toss them with the herb mixture until they are evenly coated. Refrigerate, tossing and “tumbling” in the bowl occasionally, until all the water is evaporated. The herb and salt mixture will form a crust on the tomatoes. Serve chilled. Note: the tomatoes keep for 2-3 days, UNCOVERED in the refrigerator. The drier and crustier the salt and herb coating, the better they taste. Makes about 4 cups of tumbled tomatoes. This is the most frustrating time of year. The warm weather says "tomatoes", but tomatoes don't really come into season for us for another month. This year, when it's tomato time, make some slow-roasted tomatoes and store them in your freezer. You can use them all winter and, if you time it right, you'll be using the last of last year's tomatoes in July.